IT’S SAID if you don’t bring forth what’s within you, what you don’t bring forth will destroy you. Vancouver singer/songwriter, poet and playwright Rodney DeCroo knows that choice well, and despite amassing an acclaimed body of work since his 2004 debut album, the pressure to heed an uncompromising muse nearly proved his undoing. In 2010, DeCroo began a sabbatical from music, producing an acclaimed poetry collection— and spoken word album—drawn from his childhood in Western Pennsylvania. He also mounted a one-man theatre show, all of which was an outgrowth of therapy to cope with PTSD. 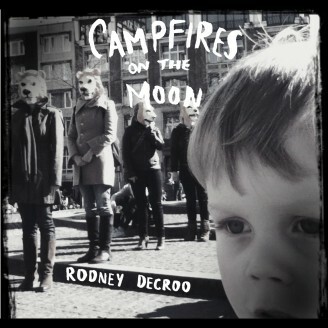 In 2015, DeCroo returned to the studio with Campfires On The Moon, an intimate collection of songs hailed as the most inviting music he’d made to date. That beacon is burning brighter on his new, seventh full-length album, Old Tenement Man, a sprawling work of unflinching lyric-driven rock and roll, infused with the legacies of Lou Reed and Leonard Cohen. Working with producer by Lorrie Matheson (Art Bergmann, Rae Spoon) at his Calgary studio Arch Audio, DeCroo struck the perfect sonic balance through which to display the full range of his poetic gifts and a renewed commitment to reaching more ears. Indeed, the fully fleshed out arrangements on songs like “When It’s Everything” and “In The Backrooms Of The Romance” leap out of the speakers with a melodic force unlike anything DeCroo has done before. Even Old Tenement Man’s most harrowing moments, such as “Ten Thousand Feet Tall,” and “The Barrel Has A Dark Eye,” thrill with the precise control both DeCroo and Matheson deploy to build the drama. Two songs in particular, “Lou Reed On The Radio” and “Like Jacob When He Felt The Angel’s Touch,” exemplify the album’s hard-bitten grandeur. They partly arose from the sad end to a decade-long close relationship DeCroo had with a neighbor who’d helped him through his personal struggles. Their bond was severed when the neighbor learned he had terminal cancer, and told DeCroo he no longer wanted to see him. DeCroo could hear him at night through their adjoining walls, but couldn’t do anything to ease the suffering. DeCroo experienced the dark side of human nature from childhood. His father, a Marine, was sent to fight in Vietnam at age 18 and the after-effects of PTSD and addiction were passed on to his offspring. Upon deserting, DeCroo’s father escaped with the family to the B.C. wilderness, resulting in DeCroo growing up in an ever-present state of fear. It’s taken DeCroo decades to deal with it all, but he worries that North America is producing more kids like him at an alarming rate. 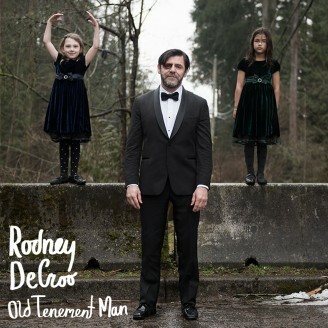 Although Rodney DeCroo’s quest for peace remains ongoing, the immense strides he’s made over the past half-dozen years has bore fruit on Old Tenement Man, an album that places him in the upper echelon of Canadian singer/songwriters. It’s an album that reflects the times in which we live, and its themes will surely resonate long into the future. Old Tenement Man is being released on Tonic Records on May 5, 2017.